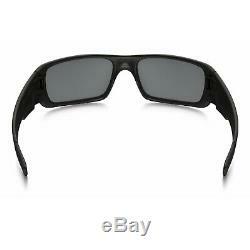 Oakley Crankshaft Sunglasses (Matte Black). The Oakley Crankshaft sleek and stylish lifestyle glasses offer top UV protection and high definition optics for the clearest, sharpest, most accurate vision. 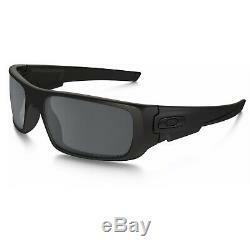 With unmatched comfort, safety, and performance, Oakley has become the standard for high quality sunglass optics. These high-definition Crankshaft Sunglasses combine sleek style and optical technology for a soaring, powerful, performance. Compared to regular lenses that magnify and shift images, Oakley lenses offer more accurate vision with less distortion. 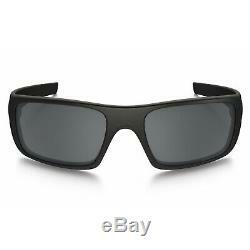 Stylish and functional, these sunglasses are ideal for casual, everyday wear. Oakley has garnered a reputation for making artistically inspired high definition sunglasses with superior optical performance and UV protection. Oakley's special HDO (High Definition Optics) technology is bringing you superior optics and protection in a sleek and stylish design. While conventional lenses merely magnetize images, HDO precision lenses give you a less distorted field of view across the entire field of view for unparalleled clarity. HDO lenses better refract light, giving you a truer visual image so that your brain and your eyes can relax. Oakley strives to better protect your eyes from harmful Ultraviolet sun rays and all of their sunglasses block 100% of UVA, UVB, and UVC rays. Harmful blue rays are blocked out from up to 400nm. With HDO, Oakley lenses meet or exceed the testing standards of the American National Standards Institute (the yardstick of performance for the eyewear industry). Crafted out of durable stress-resistant O Matter frame material, the Crankshaft sunglasses are lightweight and durable for never-ending comfort and protection. Oakley's Black Iridium HDPolarized lenses block out 99% of glare without the optical distortion and haze normally associated with polarized lenses. Featuring a Three Point Fit for precise optical alignment and comfort, the Oakley Crankshaft glasses will quickly become your everyday pair. Plutonite technology in the lens reduces glare and protects from 100% of harmful UVA, UVB and UVC rays. What's in the Box. 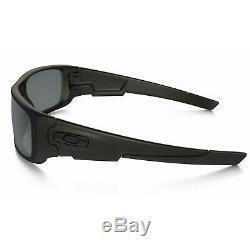 Oakley Crankshaft Polarized Sunglasses (Matte Black). Temple Arm Length: 132 mm. F There are product categories which are not returnable due to hygienic or sanitary as required by manufacturers. In an event where there is an error regarding a price error or description, we will notify you ASAP. Items removed from their'blister-pack' display packaging are non-refundable. The item "Oakley Crankshaft Polarized Sunglasses 60mm (Matte Black / Black Iridium)" is in sale since Wednesday, October 3, 2018. This item is in the category "Clothing, Shoes & Accessories\Men's Accessories\Sunglasses & Sunglasses Accessories\Sunglasses". The seller is "asavings" and is located in Brooklyn, New York. This item can be shipped to United States, Canada, United Kingdom, Denmark, Romania, Slovakia, Bulgaria, Czech republic, Finland, Hungary, Latvia, Lithuania, Malta, Estonia, Australia, Greece, Portugal, Cyprus, Slovenia, Japan, China, Sweden, South Korea, Indonesia, Taiwan, South africa, Thailand, Belgium, France, Hong Kong, Ireland, Netherlands, Poland, Spain, Italy, Germany, Austria, Bahamas, Israel, Mexico, New Zealand, Philippines, Singapore, Switzerland, Norway, Saudi arabia, Ukraine, United arab emirates, Qatar, Kuwait, Bahrain, Croatia, Malaysia, Brazil, Chile, Colombia, Costa rica, Dominican republic, Panama, Trinidad and tobago, Guatemala, El salvador, Honduras, Jamaica, Antigua and barbuda, Aruba, Belize, Dominica, Grenada, Saint kitts and nevis, Saint lucia, Montserrat, Turks and caicos islands, Barbados, Bangladesh, Bermuda, Brunei darussalam, Bolivia, Ecuador, Egypt, French guiana, Guernsey, Gibraltar, Guadeloupe, Iceland, Jersey, Jordan, Cambodia, Cayman islands, Liechtenstein, Sri lanka, Luxembourg, Monaco, Macao, Martinique, Maldives, Nicaragua, Oman, Peru, Pakistan, Paraguay, Reunion, Viet nam, Uruguay.